In December, IAM Magazine will publish our third report on the brokered patent market. The article will appear in the January issue of IAM, and will be available on their website to members December 1. We hope that you find the information useful in your patent buying, selling and valuation. Below is a sneak peek of some of our findings. Overall, the market is softening with a lower percentage of packages selling, and those that do are selling at a lower price. We estimate the market size to be $260M (2014 Market) vs. $283M (2013 Market) and to employ 173 people worldwide in 58 brokerages. 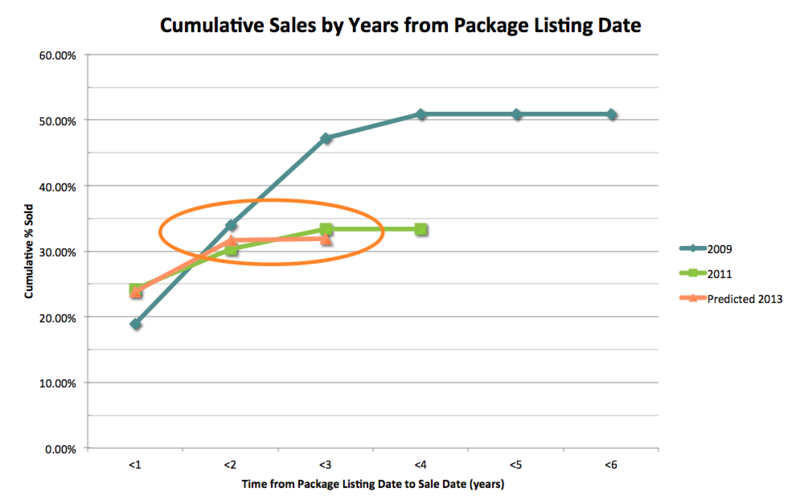 The chance of selling a package has decreased significantly, as has the sales time frame. Packages listed in 2009 had a 51% chance of selling over 4 years on the market. We estimate that only 22% of packages listed in 2014 will sell. Packages on the market have decreased in size. This creates a larger number of packages on the market with just a few assets. Notably, smaller packages (<5 assets) account for about a third of sales. Therefore, of the expected 22% total sales, most will be small packages. Asking prices dropped; the average sales price per US issued patent has decreased 23% from the $467K (2013 Market) to the $360K (2014 Market). The market is heavily skewed towards software and cloud computing as the three most common categories: application software, cloud computing, and system infrastructure account for almost 50% of the listed packages. Semiconductor is the fourth most common technology category for packages, but the price per asset in this category is much lower than in other categories. Our IAM paper also includes data relating to the types of organizations buying and selling, buyers’ filtering and diligence processes, what buyers expect of brokers and much more. As always, we continue to collect and analyze data about market to find new trends and make new insights to gain a deeper understanding of the patent market.